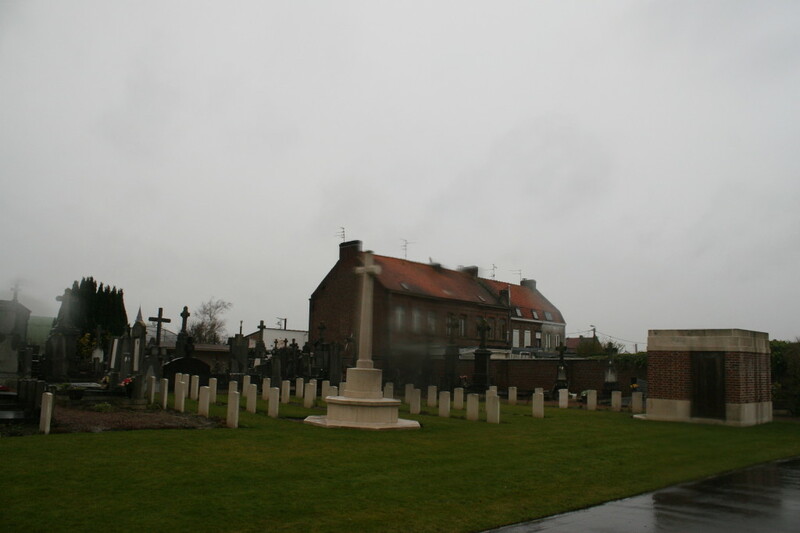 By the time we reach La Chapelle d’Armentières Communal Cemetery, the weather is at its worst. …and unfortunately Baldrick and I have, as yet, been unable to return. We have driven past since, more than once, but always near the end of a long and tiring day. You understand, I’m sure. But we’ll return one day. In the meantime, this is what you get. 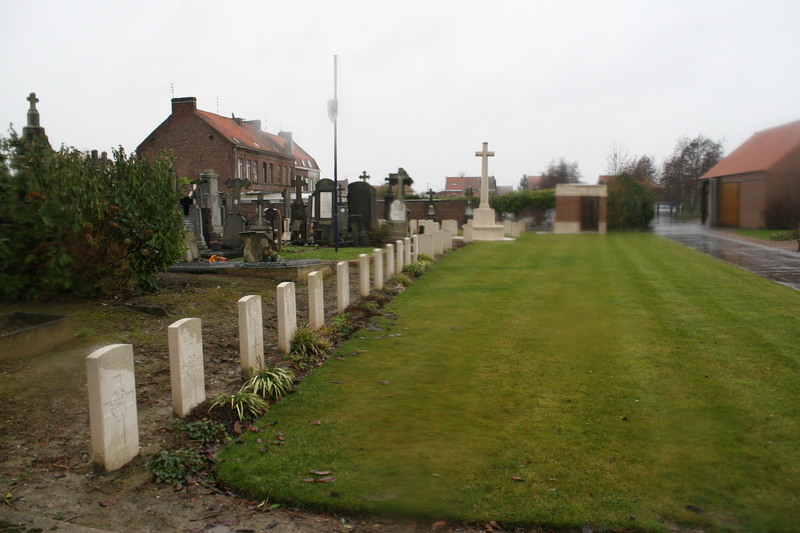 Private Beck is actually buried in Row F, which extends out of picture to the right; Row G comprises the three graves facing us immediately behind him, and those in the background facing to the left are Row H (see previous & next photo). 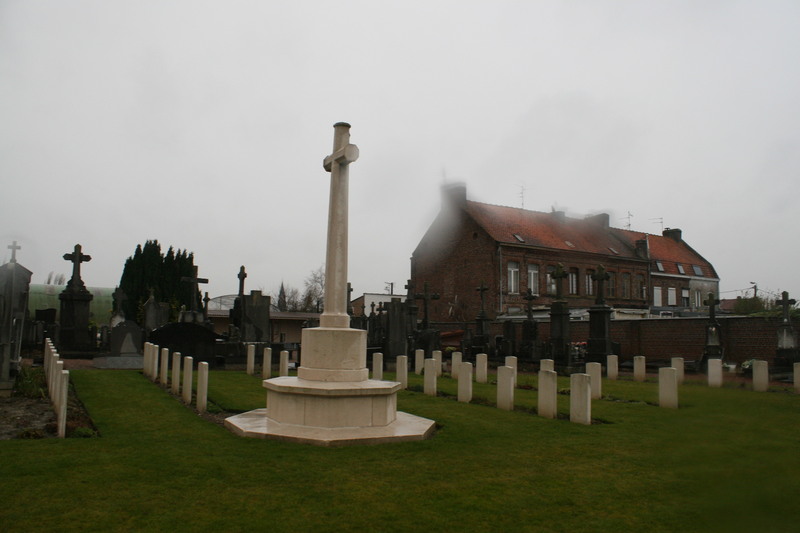 The cemetery was used fairly regularly between January and early September 1915, when it was presumably closed down in favour of one of the other British burial sites around the village of La Chapelle d’Armentières. 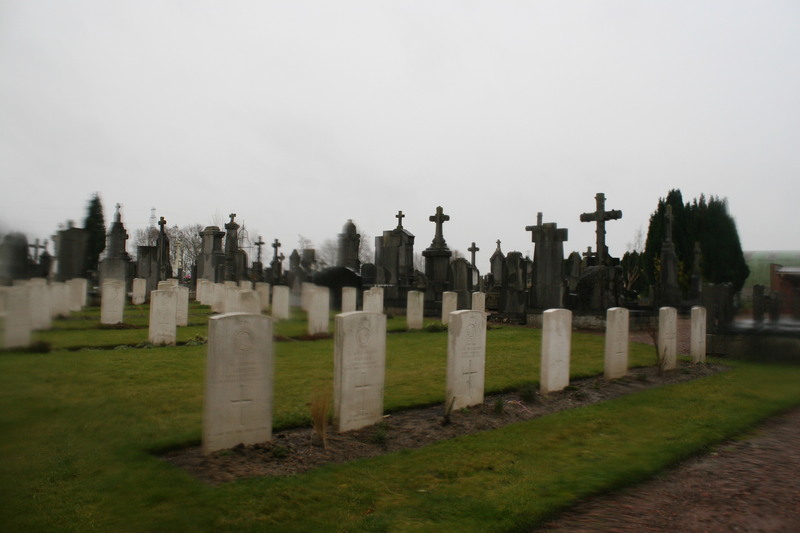 By then sixty one men had been buried here, all of whom are identified. 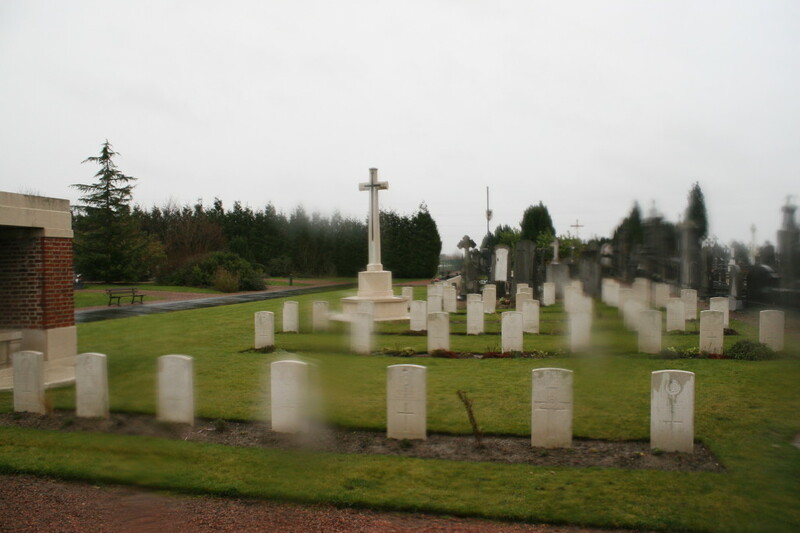 The cemetery plan, courtesy of our friends at the CWGC, can be viewed if you click the link. 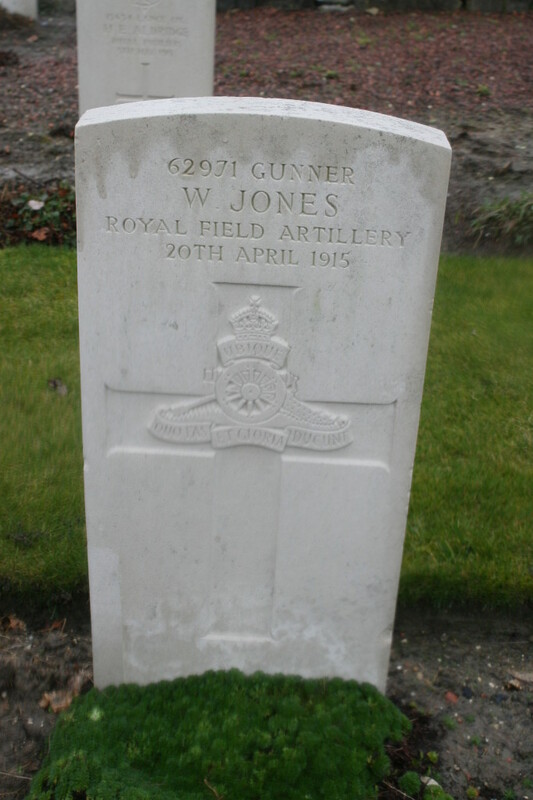 Gunner William Jones, whose headstone is pictured above, was executed for desertion on 20th April 1915. 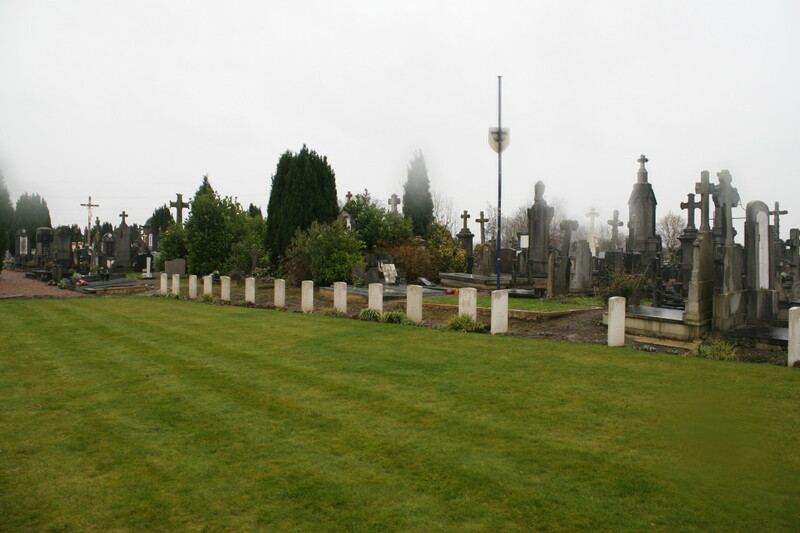 Rows F (left), E (right) and part of Row D (far right). 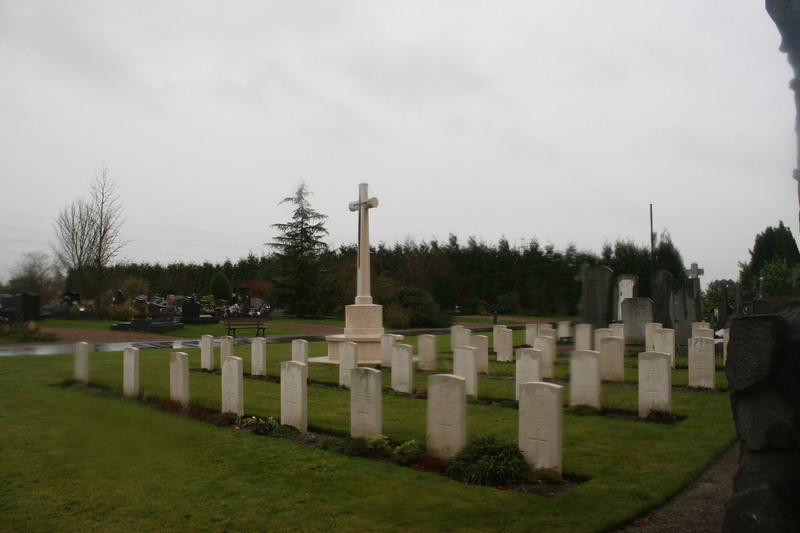 For some reason, a single burial was made in Row D in April 1916. 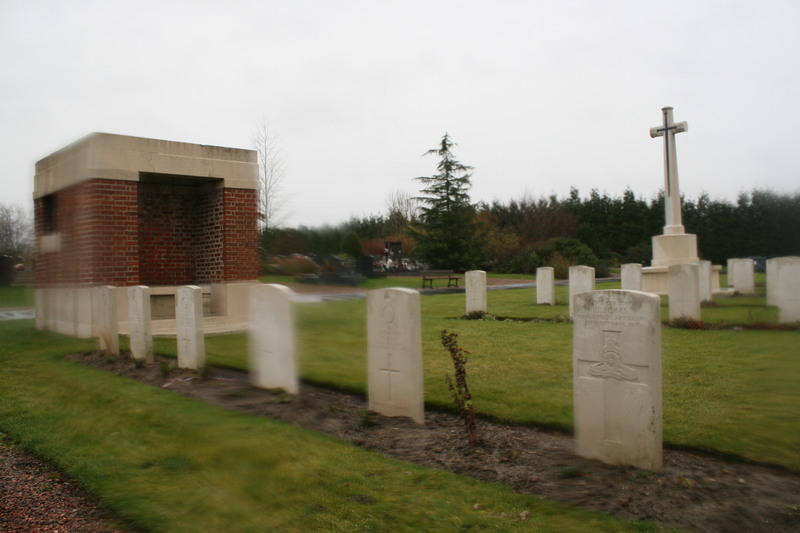 Rows B (foreground) to F cluster round the Cross of Sacrifice. 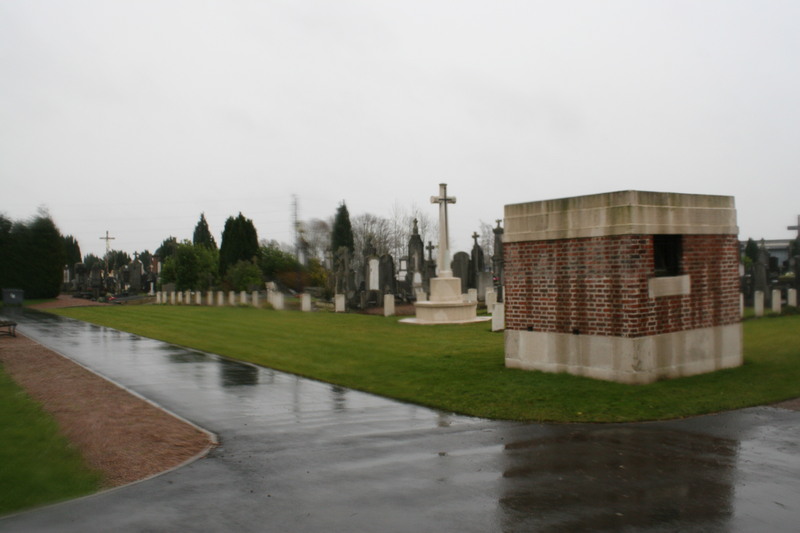 Actually a solitary burial, that of Artilleryman Corporal J. Jukes (above), had been made here in what is now Row A, in October 1914. 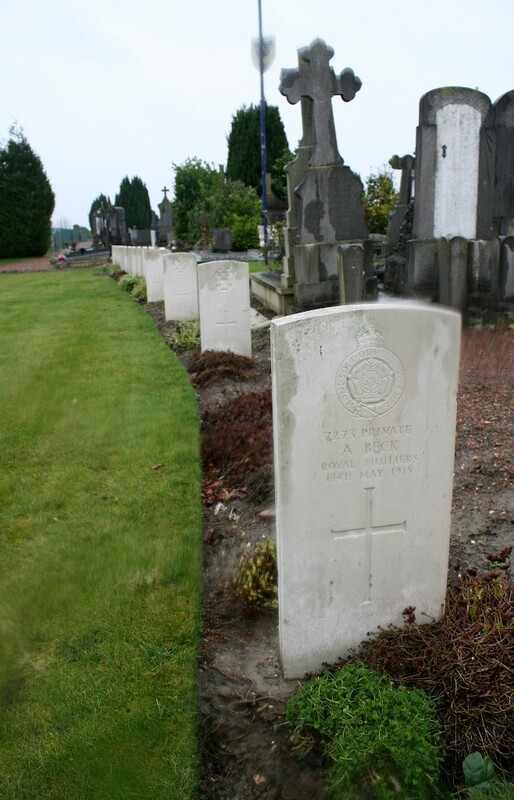 Or perhaps his body wasn’t found and buried until January 1915, although it was known that he was dead, and, indeed, on which date he died. If you see what I mean. 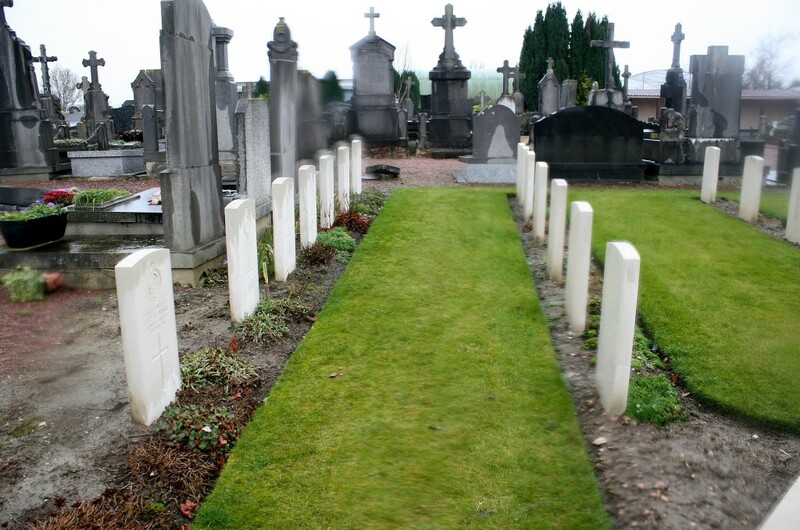 The rest of the graves in Row A are the earliest here, all from January 1915. 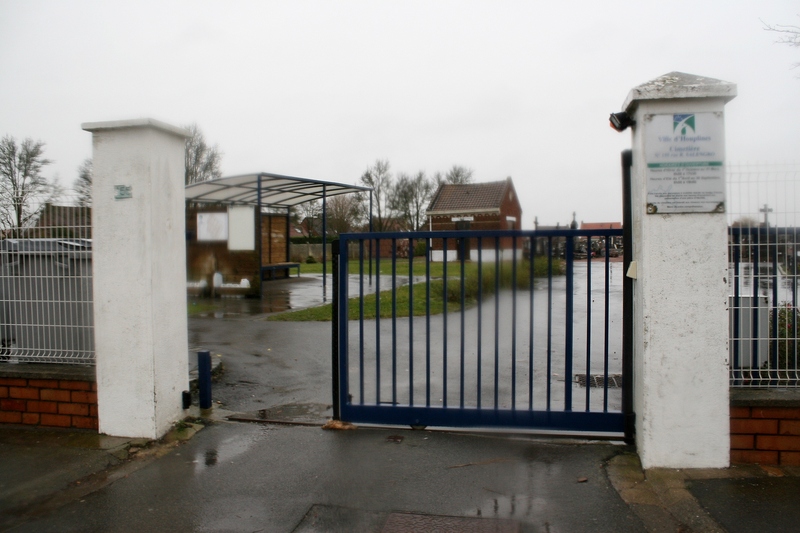 C’mon, you’ve got to admire our fortitude, if nothing else. How tempting to just head for home. 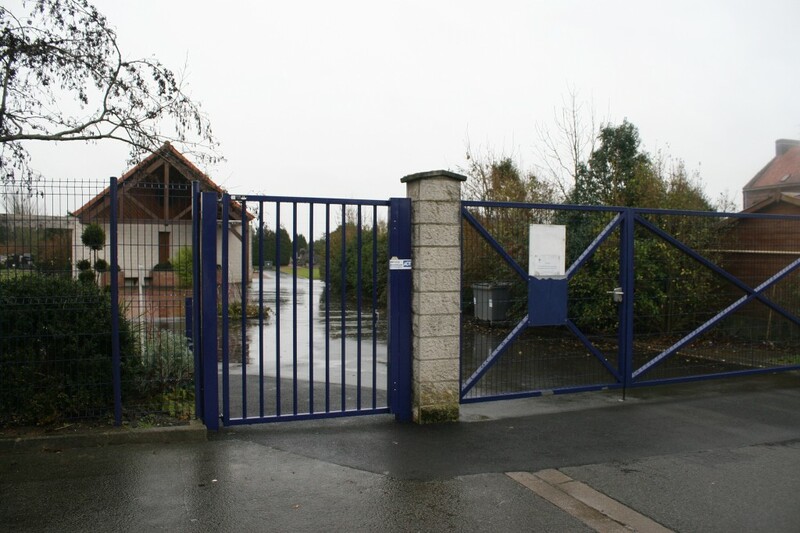 But no! We’re not done yet. Two more stops still to make. Part Thirteen, however, is a tour map of our visit to the Nursery.